TPIX architecture had upgraded to Cisco new-generation Nexus 9508 switch for enhancement of capacity, scalability and resilience in May. 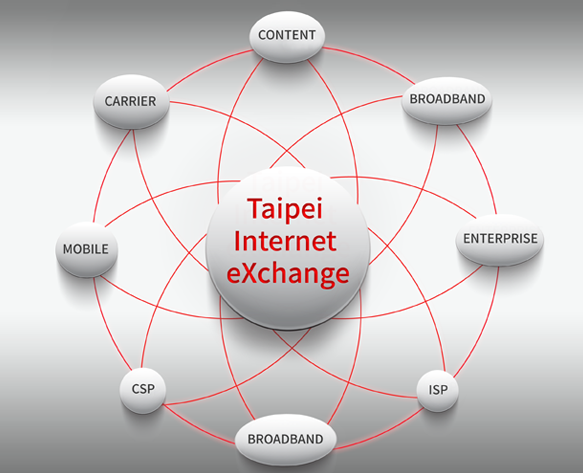 2017, and provides the members high speed access and exchange capability via GE, 10GE and 100 GE connections.TPIX supports IPv4 and IPv6. Ethernet switch provide ISP 1GE, 10GE or 100GE interface connection，and ISPs must prepare their own BGP router. Routing Reflector create peering sessions between ISPs and processing routes. Web server provides TPIX web services including traffic statistic report and operations information. The TPIX provides a "Layer 2 Service." TPIX members could be required to exchange their routing information among each other. The protocol to be used will be the BGP4 (Border Gateway Protocol version 4). In order to distinguish ISP's within this transaction, a valid AS number is required. Before you apply for TPIX member, each ISP should acquire valid AS number and IP address for NIC. TPIX can support 4-byte AS Number today. Under the "Layer 2 Service," solely connecting to the IX port will not enable the flow of traffic. There is a need to make necessary setups for exchanging each other's routing information on their connected router. This is called "peering". New TPIX member will not automatically peer all of the TPIX members. ISP will need to make a "peering negotiation" with the members you wish to peer beforehand. After negotiating and getting approval from other members, you will set the respective routers to accomplish the connection. TPIX does not guarantee its member will agree to peer with other members. TPIX member reserve the right to accept or reject peer request from and other members. TPIX will turn on port security with the MAC address connected from participant to the TPIX switch. At any time, only permitted MAC addresses will be allowed on each TPIX port and TPIX participant must inform TPIX NOC by email if there is any change or maintenance on MAC address. Storm control of broadcast is enabled at all ports to members. Platform will automatically shutdown the port measured higher then specific rate (1M bps) without prior notification. Participants must DISABLE proxy arp on their layer3 interface towards TPIX at all times to decrease the probability of DoS attacks. TPIX does NOT support trunk port or VLAN mapping to our switches. Participants must not leak IXP ipv4/ipv6(v4:203.163.222.0/24, v6:2406:D400:1:133:203:163:222:0/112) prefixes to any peers(Include not redistribute connected route to IGP, that is to treat IXP service prefixes as non-routable. TPIX will turn on BPDUGUARD. Device(s) connected to the TPIX port are not allowed to be visible as L2 bridges. This means that they should not speak STP (spanning tree). For more information about TPIX peering policy and contact information, please also refer to the PeeringDB (https://www.peeringdb.com/ix/823).